Our boat service department does everything from fiberglass work to engine repowers. Located in a large covered building next door, we can house several full size boats out of the weather and with full security. View the services provided below, and contact us if you have any questions or to set up an appointment. We also do transmission repair and engine rebuilds. Outboards: We do not perform outboard service or stock outboard motors at this time. Please contact one of the several excellent outboard service locations in the Everett or Seattle area using your local Yellow pages or an Internet search. 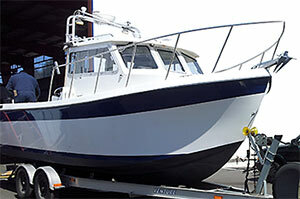 Our trained professionals clean, resurface, recondition, and repaint boat bottoms. We use every major brand of paint, including Interlux, Bluewater, Pettit, and more. We carry Bluewater and Interlux in the store, and can order in any other major brand in less than a few business days. Pricing for bottom painting varies by boat size and the amount of sanding and other work needed. We cannot give an exact quote for pricing until we see the boat bottom and its condition, and know what kind of paint will be used. We specialize in electronics installations, service, and sales. Our technicians can install GPS, Depth Sounders, Radar, Radio, and more onto your boat. We stock a wide variety of Garmin electronics, and can special order in many of the latest products from every major manufacturer. Our technicians use the highest quality wiring and connections, to ensure a long lasting installation that withstands the rigors of saltwater boating. Our custom-built trailer and truck makes haulouts a breeze. We can drive your boat directly from the boat ramp into our service building. We install, remove, inspect, and sell boat propellers, as well as repair and service used and damaged ones. Need help deciding what size or pitch prop you need? Changing transmissions or repowering? We can help decide on the perfect size and type of prop based on your specific engine and transmission specifications, to give you the best fuel efficiency and engine performance. For leaking and frustrating prop shaft stuffing boxes, we are experts at installing PSS Dripless Shaft Seals, which are a maintenance-free replacement for the stuffing box. For powerboat and sailboat drivetrains. See the PSS website for information and testimonials. We install new gasoline and diesel engines from MerCruiser, Crusader, Cummins, Northern Lights, PCM, and more. Increase fuel efficiency, power and reliability by repowering to the latest engine models. We also rebuild and service old engines, and replace manifolds, risers, and exhaust systems. Our skilled mechanics perform engine tune ups on-site, usually in just a few hours (with appointment). During winter the water in your boat's engine coolant, exhaust system, and plumbing can freeze and expand. This sometimes causes cracks in the casting of engine parts and other areas. It is important for this reason to properly winterize your boat every winter. Our mechanics specialize in winterizing and will go through your boat to make sure it doesn't get damaged during the winter, whether you keep it moored in the water or on a trailer.